​It’s easy to see why Kauai is called The Garden Isle. 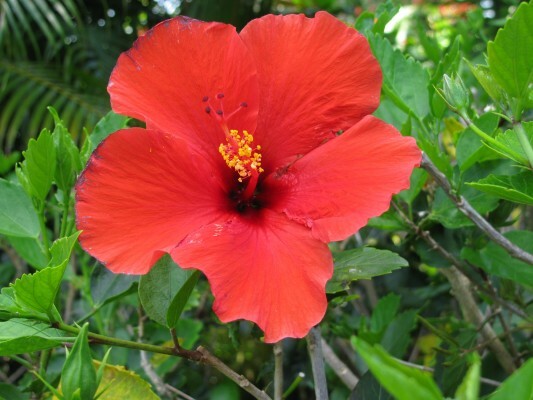 On the north part of the island, Princeville, Hanalei, and all the way to the end of the road at Ke’e Beach, the flora is dense, green and lush. The leaves are huge, the foliage thick, impenetrable. It rains a lot up here. A lot. The second wettest place on earth is nearby. Mount Waialeale gets an average of 450 inches a year. The day may start out sunny and warm but before you know it, it’s pouring. 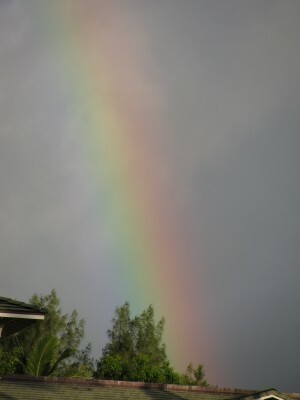 A few minutes later the sun is shining and there is a glorious rainbow. This constantly changing weather happens all day long. While you are in your room slathering yourself with sunscreen, the fat gray clouds move in and the heavens open up. The only way to avoid this is to go someplace else in Kauai. A good choice is the south of the island. Poipu for example. While it is raining cats and dogs up north, it’s balmy and dry there. Everyone is on the beach or snorkeling in the temperate Pacific. 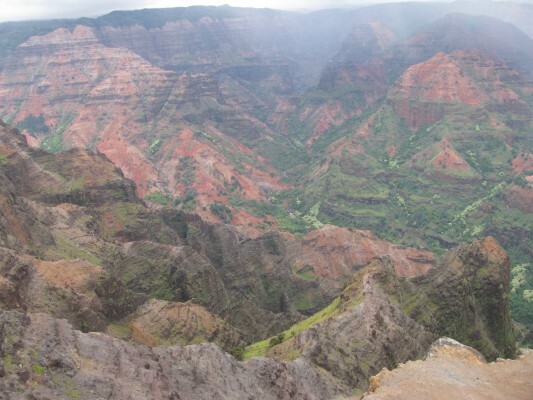 Or you can go hiking in Waimea Canyon. Some say it’s more scenic than the Grand Canyon. But the thing is, there’s something special about the north end with its narrow roads and one lane bridges, Hanalei and its hippie vibe, surf shops and muumuu stores. There’s a lot of wildlife too. Chickens are everywhere, strutting and crowing (well the roosters are). 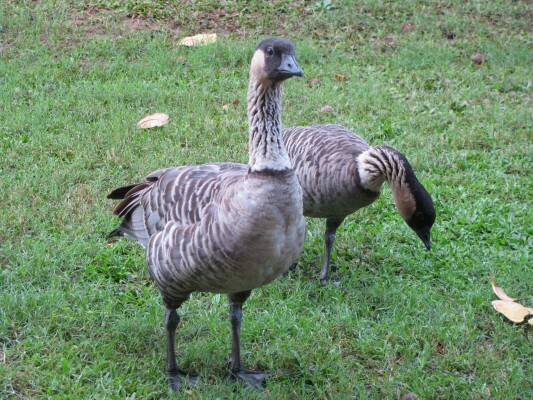 And the Nene, the state bird, stakes out its territory and chases you away with tongue sticking out, hissing all the while. 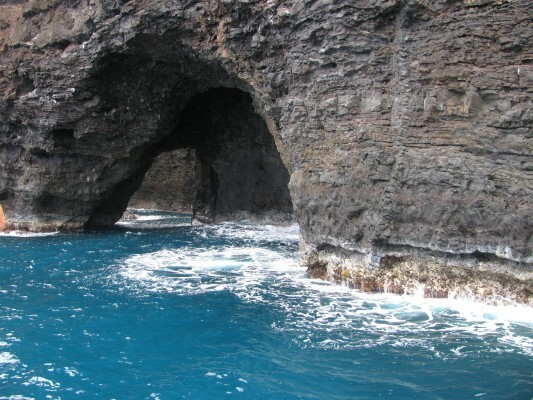 At the Kilauea Lighthouse, albatross, red-footed boobies, and frigate birds nest. 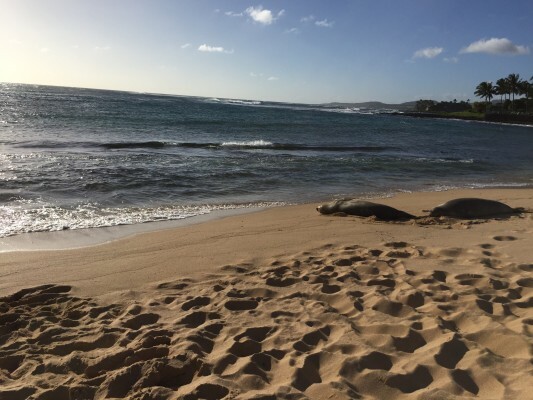 And you’re in luck if you see an endangered Hawaiian Monk Seal or two.